Meraki was founded in 2006 by two MIT graduates with funding from Google and Sequoia Capital. The focus in Meraki's formative years was building a wireless solution that combined cloud-based ease of use and administration with analytics and reporting. From the start, the Meraki Dashboard set the brand apart. The dashboard gave administrators a centralized portal to view and manage their wireless from anywhere they could access Internet. As the product advanced and became a market leader, the big players took notice, and in 2012 Cisco purchased Meraki. Since the acquisition, Cisco has allowed Meraki to prosper as an independent brand enhanced by Cisco's routing and security knowledge and expertise. The brand has expanded dramatically, bringing their vision of simplicity, analytics, and performance to newer product lines. The Meraki platform now includes data switches, firewalls, mobile device management, and security cameras on one consolidated cloud management platform. Despite the expanded portfolio and value of a consolidated solution, each of the products works as a stand-alone that neatly folds into an existing data strategy. In this article we will focus on the Cisco Meraki Video Surveillance solution (MV), the fastest growing product Cisco has ever sold. With its unique architecture, video security becomes a simple application on the network instead of a cumbersome add-on. A signature feature of the MV lineup is the use of local storage on the camera itself, eliminating the need for a centralized or cloud based “NVR” solution. The Meraki dashboard accesses the streams in an on-demand fashion. When accessing the video stream from a device on the local network, the device will directly connect to the camera and not use any Internet bandwidth. While outside the network, connections to the camera are proxied through the Meraki dashboard. The cameras themselves have 128 or 256 GB SSD and the length of time that recordings are stored on the device ranges from 30-90+ days depending on the settings selected. To control the retention of video on the camera itself administrators can adjust video quality (720p vs 1080p and different frame rates), as well as decide between motion-based or full retention – regardless of movement. Video can of course be exported as needed for long-term storage The MV solution isn’t dependent on Internet or connectivity back to the DVR for storage, using only a 50kbps stream for metadata back to the cloud when not being viewed. Due to Meraki’s local device storage with battery back-up over PoE, the cameras stay up regardless of power or Internet failure. The use of Meraki’s dashboard eliminates the need to manage, patch, update/upgrade a separate DVR software and hardware platform, future proofing your solution and reducing administration costs. True to form, Cisco and Meraki do not take data security and integrity lightly. All video is encrypted both at rest and in transit using TLS, with a valid signed certificate. The footage itself is never stored in the Meraki cloud, ensuring even a breach of their physical infrastructure doesn’t involve access to your video monitoring solution. Permissions to view and export video is granular, a local manager of a branch could view their local feeds, a regional supervisor can see all the stores under their management and a CIO or COO can view everything based on your specific organizational structure. The management and deployment of all Meraki products, including the MV lineup, takes place in the Meraki Dashboard, a single administration interface regardless of number of cameras or physical location. Rolling out the cameras is incredibly simple, reducing initial costs and improving the speed of delivery. The MV cameras are plug and play: claim them in your Meraki Dashboard and plug them in; it’s that easy. The cameras include mounting kits that any person with a screwdriver could manage to install. If cabling to your preferred location is challenging, the newest models are capable of connecting without a Ethernet connection, alternatively using Wi-Fi for their connection to the network. Meraki recently introduced their MV12 camera, enabling Wi-FI connectivity and advanced analytics. With this new camera “Object Detection” is included, allowing for identification of bodies that move through the frame. The capability to identify people gives insight into the number of entrances, peak occupancy, and most utilized hours, in addition to providing a handy motion heat map. Understanding the movement of people can be helpful especially to retail type environments where insight into the behaviors of clients based on time of day, day of week, and other factors can help companies better position their products or services, as well as ensure staffing levels are adequate, and identify physical areas that are performing poorly. This new object detection feature is only one short step away from facial recognition where the tie-ins to other applications really take off. Facial recognition could be used to identify known criminals entering a school or a retail store, match against a database to identify patrons’ patterns in a gym or casino, or to check people in at a service-based retail environment. The opportunities are extraordinary, whether the goal is to better understand customers, prevent crime, or even unlock a door. Meraki has the capability to highlight specific physical areas on the screen and then review only the frames that include movement. This makes it incredibly easy, for example, to identify when something went missing and who took it, what the activity level was in a very specific area, or every time someone goes in and out of a door. Alerts are available, notifying key staff if there is movement in a specific space. A usage example would be your business opens at 7:00AM and closes at 6:00PM, you could set up a notification in the event there is movement longer than 3 seconds from 6:00PM to 7:00AM or an unmonitored door where the notification is an alert that someone needs access. 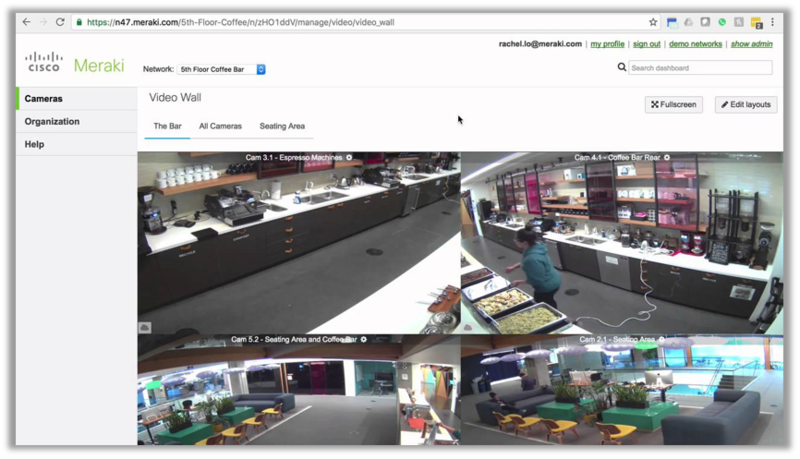 The Meraki MV product is not only a great security camera platform, it is also designed to provide valuable business insights to your organization. Centralized management in the same industry-leading Meraki dashboard makes it simple for IT teams to deploy and support. The in-camera storage simplifies life by eliminating the need for an NVR. Cisco’s dedication to data integrity shines through with all cameras using publicly signed TLS certifications and encrypting all data by default. All of this is accomplished without chewing up copious amounts of bandwidth due to the unique architecture. Meraki MV is a great solution whether you are planning to replace an existing security solution or looking to bring added security to an existing environment. The Meraki Systems Manager is a MDM (Mobile Device Management) platform that allows for a central dashboard showing all device information, with the ability to apply policy, deploy, remove, and update software on all devices across your network with a few clicks.